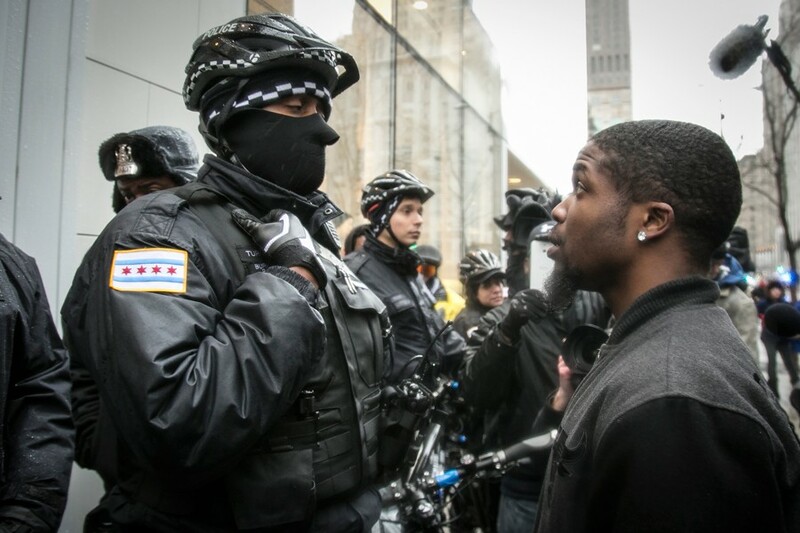 A protester yells at a Chicago police officer as hundreds march down the Magnificent Mile on Black Friday, November 27, 2015. The country is reeling. The shooting of 11 Dallas police officers—five of whom were killed—came while they patrolled a peaceful protest against police violence. Two civilians were also wounded, according to the Dallas mayor's office. It's a tragic, saddening act of violence that's likely to inflame already heated tensions over issues of race and policing. Just a few days prior, the final moments of two more black people killed by police—Alton Sterling in Baton Rouge, Louisiana, and Philando Castile in Falcon Heights, Minnesota—were both captured on video, allowing the world to bear witness to these miscarriages of justice. Sterling's demise came just weeks after lawmakers in Louisiana enacted a "Blue Lives Matter" law, which added police officers and first responders to the list of groups protected by hate crimes statutes. The state was the first in the nation to do so. Now, a similar measure could become law in Chicago, if the City Council approves an ordinance recently proposed by 14th Ward alderman Ed Burke. It's co-sponsored by a number of aldermen who, like Burke, are former police officers and firefighters. In the coming days, this detestable attack in Dallas will surely become a political rallying cry, one that could be used to fuel efforts to enact such Blue Lives Matter laws. Even so, the City Council should not pass this law. Killing or assaulting a police officer is a horrible crime—but it shouldn't be classified as a hate crime. Hate crimes laws were created to stiffen penalties for crimes against individuals or groups based on immutable identities, such as race, ethnicity, sexual orientation, or gender identity. Legal protections like these, which were enacted as far back as the Civil Rights Act of 1964, were put in place for people who have been subject to decades, if not centuries, of violence because of who they are. For black people in particular, that's historically included the specter of vigilante lynchings, death threats during school desegregation, physical intimidation at the ballot box, and even terrorist attacks on black businesses and churches such as what transpired last summer in Charleston. These crimes are fueled by supremacist hate based on characteristics that people cannot change or, in the case of religion, should not be forced to change because of fear or intimidation. Police officers are doing a job, a difficult job that comes with grave risks. Officers and emergency responders constantly put their lives on the line in service of their duty. Still, it's a job—not an identity category. If a sniper mows down police saying he hates all cops, it's a crime fueled by hate—but it's still not a "hate crime." There's no comparison between generations of race-based dehumanization and the many ebbs and flows of public scrutiny or animosity towards police. There's no parallel between the occupational hazards faced by police and the lived realities of protected groups experiencing targeted discrimination and violent crime based on their immutable identities. You can quit your job as a police officer, but you can't quit your race. Burke and other proponents say the Blue Lives Matter ordinance is about providing protections for officers and first responders. Yet Illinois law already carries felony-level penalties and fines up to $25,000 for people found guilty of assaulting a law enforcement official or emergency worker. Blue Lives Matter laws also imply that, because of protests and shifting public opinion, police officers now face levels of danger beyond the risks already associated with their jobs. But even with the tragedy in Dallas, recent statistics debunk the notion that police officers face widespread attacks. As the Guardian has previously reported, police fatalities have decreased steadily from a peak of about 127 annually in the 1970s to 41 in 2015—a 12-year low. By contrast, the Guardian's police shootings database shows that police in the U.S. killed 1,146 people last year. Per those numbers, black people were more than twice as likely as white people to be shot and killed by police, and a total of 79 unarmed black people were killed by police or died while in custody. Statistically speaking, it's still more dangerous to be black in America than it is to be a cop. So, then, what are these proposals really about? Reading between the lines of the bill in front of the City Council, it appears to be about undermining, intimidating, and silencing people who protest and advocate against police misconduct. The ordinance doesn't just make it a hate crime to assault a police officer or first responder. The proposal also contains many other sleights of hand designed to keep protesters at bay. Burke's amendment would also make it a hate crime to display "animosity" or "hostility" to police officers on the basis of their occupation. What exactly does that mean? Will using a bullhorn at a protest and shouting chants in the direction of police be construed as "hostility"? Will disrupting traffic, as protestors did Thursday night, be seen as "trespassing," also forbidden by the amendment? Will Tweeting concerns about police brutality come to be read as hate speech? The wording and terms are so broad that people engaged in all kinds of constitutionally protected speech could find themselves charged with a hate crime. Organized protests aren't to blame for the police deaths in downtown Dallas. Before shots rang out the protest was peaceful. And after, video footage shows protesters running for cover, afraid for their own lives. In a statement following the Dallas attack, the national Black Lives Matter organization said, "Black activists have raised the call for an end to violence, not an escalation of it. Yesterday's attack was the result of actions of a lone gunman. To assign the actions of one person to an entire movement is dangerous and irresponsible." Yet that's exactly what's taken place on social media following the Dallas shootings. In one noteworthy example, former Illinois congressman Joe Walsh said in a now-deleted tweet, "This is now war. Watch out Obama. Watch out black lives matter punks. Real America is coming after you." To be sure, Walsh is not alone in attempting to blame activists for this tragedy, and the #BlueLivesMatter hashtag has taken off again. One can protest against racial injustice, and proclaim that black lives matter, while finding the Dallas attack deplorable and empathizing with the victims and their families. Crying out against police misconduct and police violence isn't a call for violence against police officers; it's about demanding accountability from government and law enforcement agencies where that accountability has otherwise been elusive. Blue Lives Matter bills, however, derail from that process by attempting to conflate job-associated risks with the everyday social and institutional indignities faced by black people and other historically disenfranchised groups. And in Chicago, it flies in the face of the Police Accountability Task Force's findings that the department must directly deal with the racism that has undermined the public trust. In a June 28 speech at the City Club of Chicago, police union president Dean Angelo Sr. said officers feel like "second-class citizens" because of an unprecedented "level of disrespect." As the Tribune reported, Angelo claimed that people are taking smartphone videos of police officers in hopes of a "payday," adding "officers are baited regularly and literally, literally called every name in the book . . . just to get a reaction." He also noted, "Perceptions are real, and this is how they feel." But if Alderman Burke and his City Council peers seek more respect for police and emergency workers, the proposed Blue Lives Matter ordinance isn't the way to find it. Before Chicago activists set up camp at Homan Square, Ferguson activists camped across from police headquarters for 47 straight days. The action honored victims of recent police-involved deaths and opposed the proposed "Blue Lives Matter" ordinance. Newly obtained video from Saturday’s demonstration calls into question CPD's account of the events that led to Ja'Mal Green being charged with aggravated battery of an officer. More than 1,000 people rallied and shut down traffic on Michigan Avenue Monday at the behest of four teenage girls. Plus, drug maker Pfizer agrees to truth in opioid advertising. Chicago's black police officers describe navigating dual loyalties—to the force for which they work and the communities from which they came. When in doubt, consult the hate-crime law.